As winter draws to a close, many people are looking forward to shedding their heavy layers, finally turning off their heating systems, and opening up the windows to air the house out. There’s nothing better than enjoying the first signs of spring, and while you may be looking forward to all of the fun and excitement that warm weather brings, you also have to think about what spring and summer means for your HVAC. Now is the time to schedule your routine HVAC maintenance appointment, and our contractors are ready to lend a hand. Our four sister companies work together to provide expert HVAC services to residents of New Jersey. Whether you’re in need of a tune-up, repair, or an installation, you can count on us to arrive on time and do the job right. Contact our HVAC company to get started today! 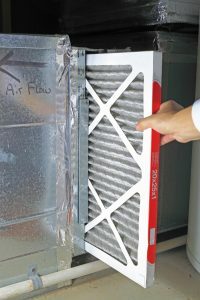 When preparing your HVAC system for spring, one of the first things you will need to do is change the filter. It’s important to replace your air filter every 90 days, or more often if you have pets. However, many people fail to do this as often as recommended. At the bare minimum, you should change your air filter when you have your HVAC serviced twice a year. Not only will this help improve the air quality in your home, but it will also help your HVAC system run more efficiently and save you money on repairs and utility costs in the future. As you begin to compile the list of chores you will need to complete during your spring cleaning this year, it’s a good idea to add cleaning your HVAC system to the list. Aside from changing the filter and scheduling maintenance appointments, most people don’t think about actually cleaning their unit. Cleaning your outdoor air conditioning unit is not a difficult or lengthy task, and it will help improve the airflow and prevent overheating when you finally turn your system on during the summer. To clean your outdoor unit, simply remove any debris that may have collected around the unit during the winter. Remove any excess leaves, dirt, or sticks from around your unit. If your unit is located in an area of your home near shrubs or foliage, make sure to trim back any plants so that they won’t disrupt the airflow of your unit. During the transition between spring and summer, many people choose to give their HVAC system a break while they enjoy the mild temperatures. In the winter and summer, a programmable thermostat is necessary to help regulate the temperature in your home and save money on your utility bill. However, if you don’t already have a programmable thermostat installed, spring is the perfect time to make the switch. Schedule Your Spring Maintenance Appointment Today! These are just a few tips to help you prepare your HVAC system and your home for the warmer spring temperatures. If you’re in need of HVAC maintenance, or you’re ready to upgrade your system altogether, then our HVAC company can help. We proudly provides HVAC services to residents throughout New Jersey. Give us a call to schedule an appointment today, and keep an eye out for part two of this series!